The T.A.M.I. 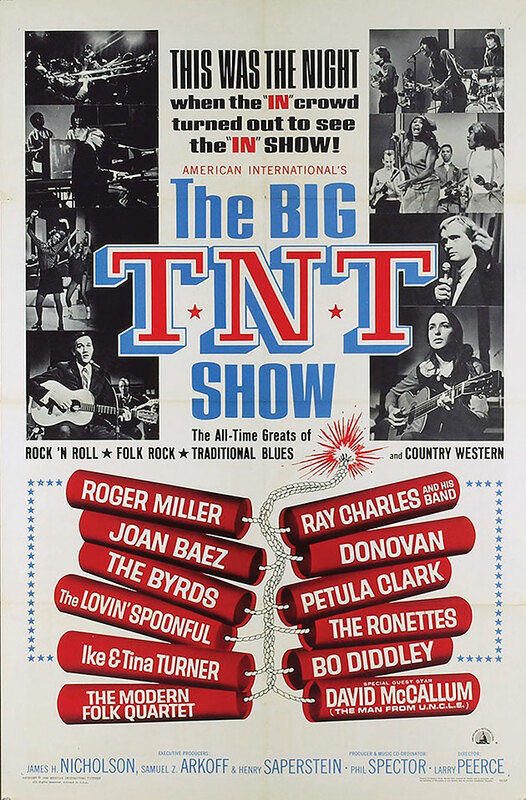 Show (1965) and The Big T.N.T. Show (1966) — two concert films that captured dozens of the 1960s’ most popular musical performers from Ray Charles to The Rolling Stones — have been released on Blu-ray disc. Together the shows create an essential musical time capsule of their era. Fans of classic rock and soul rejoiced when the legendary concert Steve Binder-directed film T.A.M.I. Show made its DVD debut on Shout! Factory in 2009. 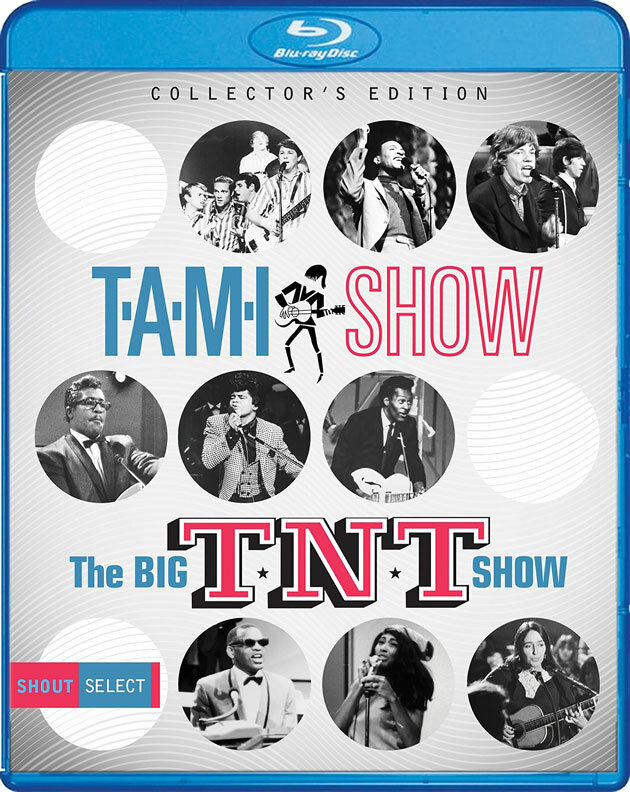 Now that landmark film made its Blu-ray debut, along with its long-lost—and much requested follow-up — The Big TNT Show, directed by Larry Peerce, on December 2, 2016, as part of the 2-disc Blu-ray set T.A.M.I. Show/The Big T.N.T. 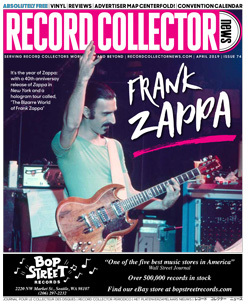 Show Collector’s Edition, from Shout! Factory. The Big T.N.T. Show was also released as a standalone DVD. The package contains all the bonus features from the T.A.M.I. Show DVD, plus new interviews with The Big T.N.T. Show performers Petula Clark, Henry Diltz and John Sebastian. 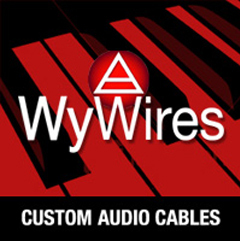 The product is mastered from a High-Definition transfer. 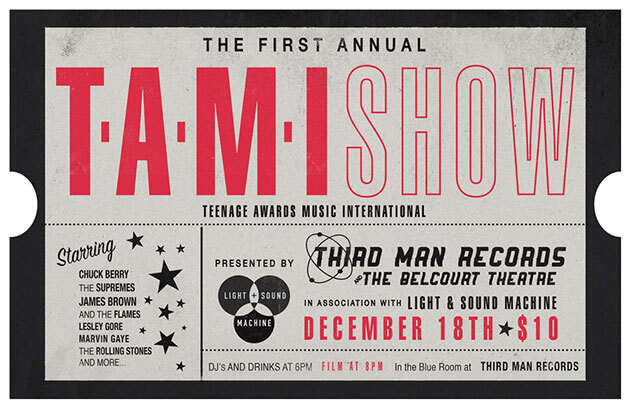 One of the most acclaimed rock events ever captured on film, the 1964 concert known as T.A.M.I. Show [Teenage Awards Music International] presented a lineup like no other, the Rolling Stones, James Brown, the Beach Boys, Marvin Gaye, the Miracles, the Supremes, Chuck Berry, Lesley Gore and other acts took the stage one after another rehearsed and recorded over two days and nights on October 29 and 30th on Pico Blvd. at the Santa Monica Civic Auditorium. David Winters and Toni Basil served as choreographers. Marshall Berle, Howard Wolf, John Landis and David Cassidy were in the audience. I was literally across the street, with my surfer pal Peter Piper during one afternoon at the Con Surf Board shop and too busy buying paraffin wax for my skateboard to even realize what was happening inside that venue. Aside from the five rock groups, all the performers were backed by a band assembled by musical director Jack Nitzsche. Including Hal Blaine, Glen Campbell, Tommy Tedesco, Don Peake, Barney Kessel, and Leon Russell, along with Fanita James, Jean King, and future solo star Darlene Love, billed as the Blossoms, provided backing vocals. Director Steve Binder, a native of Los Angeles, departed the University of Southern California just before graduating to apprentice under host Steve Allen, who pioneered a variety show. Binder, barely in his twenties, then took on Jazz Scene USA, bringing live performances by musical masters to a network audience. Binder understood the unique requirements of lighting and blocking for musicians in an optimal setting. Once The T.A.M.I. 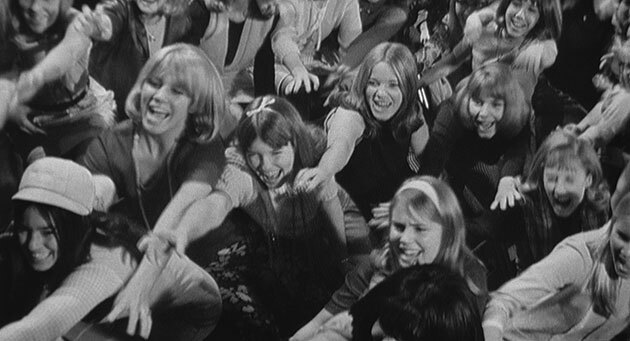 Show was screened in Britain and the United States theatrically in 1965, the flick informed every subsequent rock concert feature film. [It had a very brief December 1964 exclusive run in Los Angeles area movie houses]. “Going back to Steve Allen and Hullabaloo where I was collecting people all the way through my career that I wanted to have in my team and work with,” Binder explained in a 2008 interview. Binder would go on to direct many music TV specials, including the seismic Elvis: The ’68 Comeback Special. The package contains all the bonus features from The T.A.M.I. Show DVD, plus new interviews with The Big T.N.T. Show performers Petula Clark, Henry Diltz and John Sebastian. “I met the Stones in 1964,” Jack Nitzsche told me in a 1988 interview. “Andrew Loog Oldham called me up. He and the group had met Phil Spector and Andrew and the Stones wanted to meet me. A little later, the Stones started working at RCA. “I got them into The T.A.M.I. Show. I put the band together and did all the arrangements. I was the musical director. I had told the producer, Bill Sargent, the Stones were going to be big. I felt the Stones could close the show. “Bill said ‘James Brown is going to close the show.’ We all stood at the side of the stage watching James Brown do his act. People were standing and screaming for James. (Legend has it that James told the Stones, ‘you’ll never be able to follow this.’). Then the Stones came out and all the girls started crying. It was a whole new emotion! “I put Leon Russell in The T.A.M.I. Show band. He’s all over the soundtrack. I met him with Jackie DeShannon; she introduced me,” explained Nitzsche. “Leon at the time was playing piano in a bar in Covina. He was an innovative piano player. He was good. 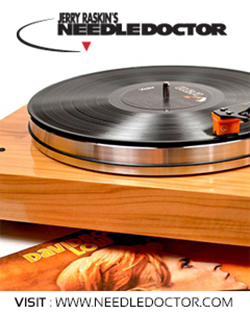 I heard him on a Jackie DeShannon record. In those days it was real hard to find rock ‘n’ roll piano players who didn’t play too much. Leon talked the same language. “In a stunningly monochromatic case of Life imitating Art imitating Pop and Soul. The TAMI Show is the living, beating, in-the-flesh reincarnation of all those cavalcades of stars Alan Freed would assemble during the closing reels of most each and every Fifties B-flick beginning with the word ‘Rock.’ Indeed, in TAMI we can still see Gerry Marsden in a guitar duet to the death with none other than Chuck Berry, Mick Jagger wisely conceding to take on the blue-flaming Butane James Brown, the Barbarians’ five-fingered drummer practically inventing Garage Rock, Marvin Gaye hitch-hiking after Diana Ross’ supreme eyeful, and to top it all — to HOST it all, no less — those Clown Princes of Surf ’n’ Roll themselves, Jan and Dean! “Steve Binder recorded absolute history with this screaming little film; even the briefest glance towards Dennis Wilson’s mop top during ‘Surfin’ USA’ will tell you why,” is how music journalist Gary Pig Gold described the legendary sight and sound collaboration in 2005. In 2004 I interviewed Andrew Loog Oldham, the manager/producer and publicist for the Rolling Stones, and I asked him about The T.A.M.I. Show. “Why it works for me is the fear and loathing in Santa Monica There you go. Come on man, it’s a magic moment. “Seeing the Motown acts was terrific. Seeing Jack Nitzsche and Dave Hassinger. It was the film within the film. ‘Isn’t it nice to be in this business? Everyone is working together for one thing. The Beach Boys’ shirts were horrendous. Isn’t it nice we’re all here?’ The Stones were becoming successful, and getting good, and wait a minute, we gotta follow James Brown? In the early sixties, engineer Sargent with Joseph E. Bluth developed an electronic camera system with better resolution than traditional television cameras known as Electronovision technology. Bluth served as technical director on the Los Angeles television station KTTV 1950-1951 TV series, The Buster Keaton Show. In November of 1974 for Melody Maker, I interviewed Bobby Rogers, a founding member of the Miracles with his sister Claudette Rogers, Ronnie White, Pete Moore, and William “Smokey” Robinson. “I really loved touring with the English groups, back in 1963 and 1964. We used to tour with the Rolling Stones and people like Georgie Fame. During the breaks from touring, a lot of the groups would ask questions about certain songs on our albums. 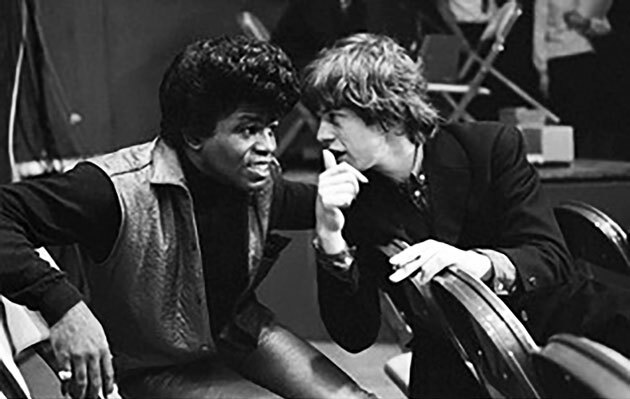 I remember when we filmed The TAMI Show, Mick Jagger would ask me about what I’d thought of the album James Brown Live At The Apollo, which was his favorite LP. One time on a tour he mentioned that he’d like to record a Marvin Gaye song for the next Stones album. A month later, ‘Hitch Hike’ was being played all over Detroit radio,” marveled Rogers. In a 2001 interview I had with Bill Wyman, I asked about The T.A.M.I. Show and the stage presence of the Rolling Stones. “The band was great live always. Always. The Stones were a better live band than any other band at that time. I’m not saying they were the greatest songwriters or the greatest recording artists, but they were the best live band wherever you went. You could go up on stage and blow everybody away no matter who they were. Originally billed as a companion piece to The T.A.M.I. Show after that event’s success, The Big T.N.T. Show holds up as an essential time capsule from its day. David McCallum, a rising star appearing in the new TV series The Man from U.N.C.L.E., was tapped to emcee. Footage also includes shots of the Hollywood haunts Chateau Marmont, Ben Frank’s coffee shop, and fleeting hot spot The Trip nightclub. Don Randi was the musical director for The Big T.N.T. Show that Phil Spector produced and Larry Peerce directed, who would eventually helm the feature movie Goodbye Columbus. The Big T.N.T. Show set location at the Moulin Rouge was where portions of the Ross Hunter-produced and Douglas Sirk directed Imitation Of Life motion picture starring Lana Turner, Sandra Dee and Susan Kohner were lensed. Many girls in my Los Angeles junior high school homeroom class were invited to the affair while the boys were encouraged not to attend. One afternoon in 1976 at Phil Spector’s mansion in Beverly Hills while doing an interview with him for Melody Maker, I asked Phil about his monumental catalog as well as the music he produced in live settings as exemplified in The Big T.N.T. Show. “The musicians I have never outdo me. I’m not in competition with them. I’m in complete accord with them. You need the ability so you hire the best. I have the creativity. I know what I want. Donovan would remain in Hollywood after the taping, and soon record “The Trip” and “Season of the Witch” at the Columbia studios on Sunset Blvd. later sequenced into his Sunshine Superman album. To this day, Nilsson’s song is the opening theme to the weekly DJ Rodney Bingenheimer’s Rodney on the ROQ radio shift on KROQ-FM 106.7. Frank Zappa, Sky Saxon, Mary Hughes, Rodney Bingenheimer, Johnny Legend and Ron and Russell Mael [later of Sparks] are shown on screen in The Big T.N.T. Show audience. “I went to the taping. There was an open-door policy,” volunteered Bingenheimer. “I might have gotten tickets at Wallach’s Music City on Sunset and Vine. “Phil Spector was around. Backstage there was food and all the cool bands from the Sunset Strip were there. This was the event of the sixties in a theater with a revolving stage. “I spent some time with David McCallum. We talked about music. His father was a classical musician in England. I was introduced to Donovan. And I sat in the middle of the audience when he sang on a stool. It was cosmic! “The Ronettes were amazing. I loved Ray Charles. To this day, his LP, Ray Charles Sings Country and Western is one of my favorites,” Rodney enthused. “We were watching this mind-blowing show in color but we knew the movie from it was going to be in black and white. What was really nice about the whole thing, and this what Hollywood was like during 1965-1967, was that many of the acts at the show hung out in the lobby and talked to fans and signed every autograph. I had already seen the Beatles at the Hollywood Bowl and this event was just as incredible. This sanctioned commercial Big T.N.T. Show product has been hailed as one of the definitive music flicks from the coast with the most. “We did The Big T.N.T. Show with Phil,” offered Don Randi in a 2008 interview I conducted with him. “And, on all our dates, we all could read, except maybe a few of the guys who were brought in as players and specialists. All the guys could always read chord charts. That’s for sure. I had Barney Kessel on The Big T.N.T. Show. “My guys in the studio could play live anywhere,” stressed Randi. “They were capable musicians. The Big T.N.T. Show was fantastic because of Phil. And he gave me the opportunity, ‘cause otherwise I could have taken another date. But when Phil calls, he was ‘first call’ for me. If I were going to do something else many times I would move things around to accommodate him. “You’ve got to remember that most of the guys that were in ‘Phil’s band’ especially were all jazz players and rock ‘n’ roll was a living for them. And a lot of them didn’t like it as much as I did. I have to be very frank about it. I always liked the rock ’n’ roll part of it. I thought it was great fun and sometimes very musically interesting. Not all the time. 80 percent of the time. We got to do some things on rock ‘n’ roll dates we could not do in jazz and studio settings. It’s an interesting concept but those guys were very capable. They were the best musicians and still are the best musicians,” Randi boasted. Randi’s principal stagehand was Robert Marchese, a record producer, who later won a Grammy for producing the first live Richard Pryor comedy album from The Troubadour. Marchese previously engineered some sessions for Spector. 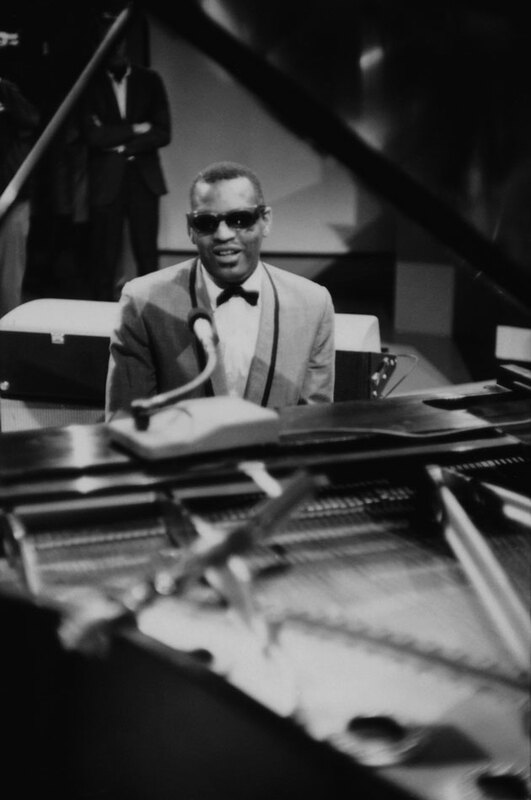 At the taping, Marchese observed a conversation between Spector and Ray Charles. “Don Randi got me the gig as his assistant,” recalled Marchese. “I was setting up the stage and working with the orchestra in the pit,” Marchese relates from Pittsburgh, PA.
“The arranger/producer) Arif Mardin was there and gave me a copy of the Otis Redding album, Otis Blue. I saw Joe Adams, who was a well-known radio DJ in L.A. (The Mayor Of Melody) and an actor (Carmen Jones). “The then King-Of-All-Media-in-waiting Phil Spector not only fully launches action with the ultra-Modern Folk Quartet’s ‘This Could Be The Night’ — setting composer Harry Nilsson’s career on its way in the process,” underscores writer and archivist Gary Pig Gold, “not at all coincidentally — but stuck all the way round to produce the T.N.T. to boot; glimpse his ivories right beside righteous Joan Baez, f’rinstance. “Uncle Phil also graciously allowed Ronnie out to front her fabulous Ronettes … while keeping both ears keyed onto Ike and especially Tina Turner too, you can bet. For further insights into both of these history-making game and frame films, bundled together on Blu-ray, I readily suggest reading Rock ‘N’ Film: Cinema’s Dance With Popular Music, a terrific book penned by Dr. David James, published in 2016 by Oxford University Press. In addition, there is also my own 2005 examination, Hollywood Shack Job Rock Music In Film and On Your Screen, published by the University of New Mexico Press. Harvey Kubernik has been a music journalist for over 44 years and is the author of 8 books. During 2017, Sterling will publish Harvey Kubernik’s 1967 Complete Rock Music History on the Summer of Love.